The European demo includes an offline tutorial and three challenges that can be tackled in co-op either offline or online. 'Slay the Great Maccao' (Beginner), 'Slay the Malfestio' (Intermediate), and 'Slay the Nargacuga' (Advanced). Monster Hunter Generations isn't far away, and during today's Nintendo Treehouse stream it was announced that it'll have a demo to keep everyone busy until it arrives on 15th July. It was shown off during the broadcast, with four players tackling an Arena quest against Malfestio - that's a large, bright blue owl. It'll be available in multiple ways. First off 'select' 3DS owners are going to be emailed two demo codes each; that's happening 'soon', so keep an eye on that inbox. Secondly, it'll be available for all to download from the 3DS eShop on 30th June. Finally, the demo has been added to the E3 2016 Humble Bundle Digital Ticket - it's in the $4 tier. So if you're really keen you can pay to get it, while naturally getting a bunch of other codes for a mix of PC, PS4, Xbox One and smart device downloads. As for the demo itself, it features four player co-op, and we hope it'll follow the lead of its predecessor and support online play - for the record the previously released Japanese demo does have online play. Let us know whether you've been able to get hold of a copy! I'm so hype for this you wouldn't believe. If I don't get a code I'mma go crazy! Anything on whether we get this in PAL regions as well..? That's a 2nd reason for me to get that bundle... unless I get it via e-mail. I've been lucky with demo codes. Has anybody gotten codes yet? @Tsurii Yeah, the Humble Bundle is PAL too, I expect the email distribution will be too. @ThomasBW84 ah, good to know. Thanks. Have we gotten any Dragon Quest stuff (DQ7 / DQ8) mentioned today?? I've been at work and missed today's event. @cbkummer whoops!! Thanks gonna check it out! Downloaded! Time to get hunting! Oh hey, I didn't realize Pathfinder: Adventures was out already! has anyone NA got codes yet? Only thing I don't like about the code distribution idea is the beggars. Guess a day off the internet will help. So even the Humble Bundle is a PAL code, not US, huh? Hype! After a good break from MH4U (and my 3ds) I think I'm ready to hunt some more monsters. Ugh Monster Hunter, just not as good as Final Fantasy Explorers. What has always bugged me about monster hunter is its speed and skills that lack the ability to hit multiple enemies. Explorers fixes that. @GameOtaku Which "skills that lack the ability to hit multiple enemies" are you talking about? You make it sound like there isn't a single thing in the game that can hit more than one target at a time. Have you ever used a long sword's spirit round slash that slaps everything on screen? (even teammates; sorry, guys ) A greatsword's super swipe which has a huge arc of destruction? Gunlance shelling? Crag shot? Charge blade axe swings? There are numerous attacks that connect with multiple targets. Even then, though, the game is primarily geared around dealing with one large target at a time. In the event of multiple large monsters, you use dung bombs or smoke bombs to make things easier on yourself. Not sure what you're getting at with the speed thing. Do you find the gameplay too fast or too slow? It's way to slow, I have mh4u and even using dual blades which is decent it feels as though the whole game just slogs. All the weapons you mentioned are also slow on execution, while in explorers it moves so much faster and to me just controls better not to mention slogging through 45 mins just to hunt down one skittish monster. @GameOtaku The execution of attacks is part of the experience. These are gigantic slabs of steel and bone you're swinging about. The devs obviously sought to express a sense of weight through the animations. This is also a core facet of the timing strategy that is fundamental to the game and makes it so satisfying to become proficient in. I can understand 45 minute hunts if you're a complete beginner and just learning the ropes. Once you get the hang of things, though, it's unusual for any caravan hunt, if you're properly geared, to take longer than 10 minutes on average. Same goes for guild hall quests if you have a competent team. If you do not find this style of game play to your tastes, that is one thing and you should feel free to state as much. But, to flatly proclaim that Monster Hunter is "just not as good as Final Fantasy Explorers" seems dubious at best. Particularly when you are basing your position on something untrue ("skills that lack the ability to hit multiple enemies") or your own lack of knowledge and/or experience of the game's mechanics. 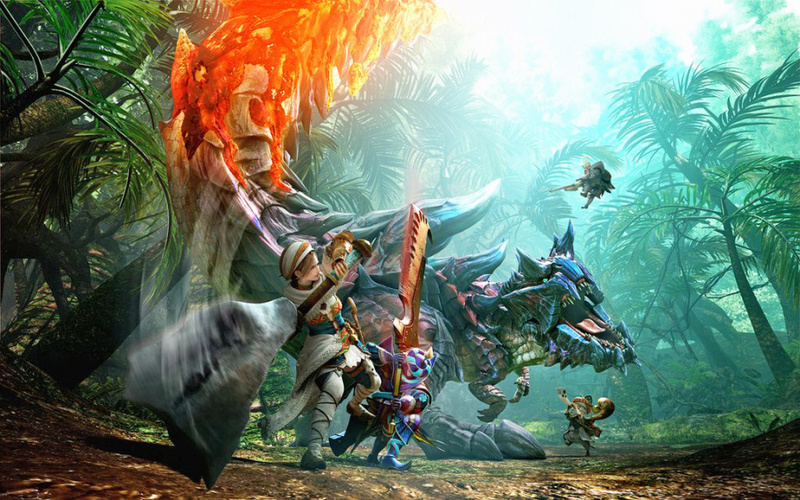 @GameOtaku I'm glad you like FF Explorers, but everyone knows MH is a much better game. It's a fact, look it up. This stupid code poop again? OH MY GOD! @MisterMan I concur: FFE is like Romper Room to Monster HUnter's BS from Harvard, Masters from Oxford, and dual Doctorates from the Sorbonne in monster anatomy and weapon crafting. @Zoda_Fett I mean emails could be sent within the next hour. I did just read an article on Siliconera stating that early-access codes will be released Friday. @MercyfulMisfit THANK YOU SO MUCH!!!! Just got mine! See you in a month, Internet! Anyone have an extra code. I really want to test out this game. I would very much appreciate a code. @rushiosan If I get an email I will give you one of the codes. The EU demo (available now) has any usage limitations? Or is it unlimited like MH4U special demo? Been waiting for so long for this game. Its so amazing how far this series came since the ps2! Wow, showing my age there, lol. I already love the Tamamitsune! I can see why one might not like the slower-paced gameplay of Monster Hunter, but I like it because it's not just a mindless action-packed button masher which seems to be the common trend for action games today. Each attack is slow and deliberate with longer cooldown times to promote intelligent decisions when fighting monsters. There's a reason potions take 3 seconds to drink; it's so that you make sure you are in a safe spot before using one. It is also meant to discourage playing stupid and getting hurt against monsters like the Tigrex and Deviljho which can easily punish a potion drink. Monster Hunter is slow and deliberate, which is why a lot of new players don't like to play it: they just like mashing buttons to win and always being safe doing so. @Megumi_Sagano No. It's the same as the Japanese demo: Great Maccao -> Malfestio -> Nargacuga. If anyone also has any extra North American codes, I'd greatly appreciate it! My email is: [email protected] If I receive an email of two codes, I'll do the same. The Humble Bundle codes are up and running and only $4 if you're desperate. I just picked one up and I'm starting the demo now (I'm in NA). Just in case, if someone as one NA code... it seem my luck with demo code as run out! Somebody got any spare codes? Thanks in advance if somebody can give me one.